How do I push SugarCRM records to SalesScreen? 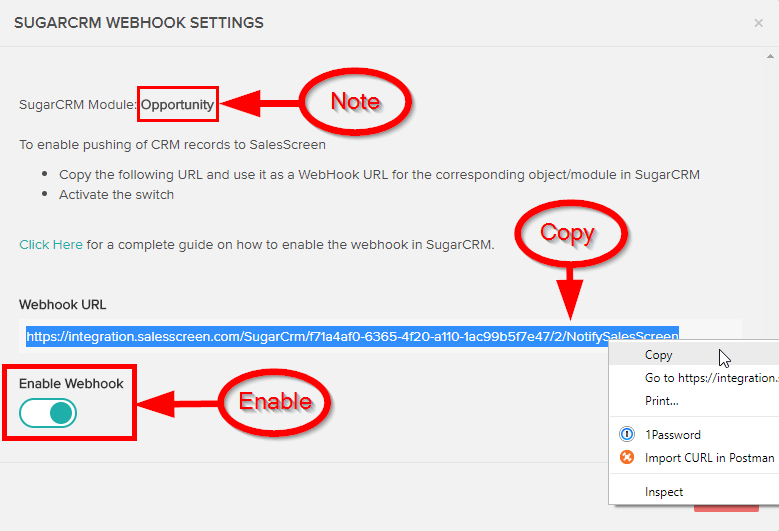 Push data from SugarCRM to SalesScreen by utilizing webhooks. You must have integrated your SalesScreen account with a SugarCRM organization and have active subintegrations (data flows). By default, subintegrations retrieve (pull) new or updated records from SugarCRM every 5. minutes. A record represents an instance of a SugarCRM module — for example, an Opportunity or a Campaign. SalesScreen will only have to process data when an actual update has occurred, which is more optimal for both systems — rather than using resources every 5 minutes regardless if records have been updated or not. SalesScreen will be able to receive information about deleted SugarCRM records, which enables removal of the corresponding data in SalesScreen. However, it requires a small effort on your side to enable it. Something that is explained in detail in this article. Please note that synchronization of deleted records via webhooks is discussed in Step 5. In SalesScreen, navigate to the SugarCRM integration dashboard (Manage > Settings > Integrations > Manage SugarCRM). Click the rocket icon next to the subintegration you want to enable push for. In our example we'll choose the first subintegration, which synchronizes Opportunity records as sales activities. In the popup view you will be presented with the main ingredient for webhooks; the URL. Select and copy the entire URL. 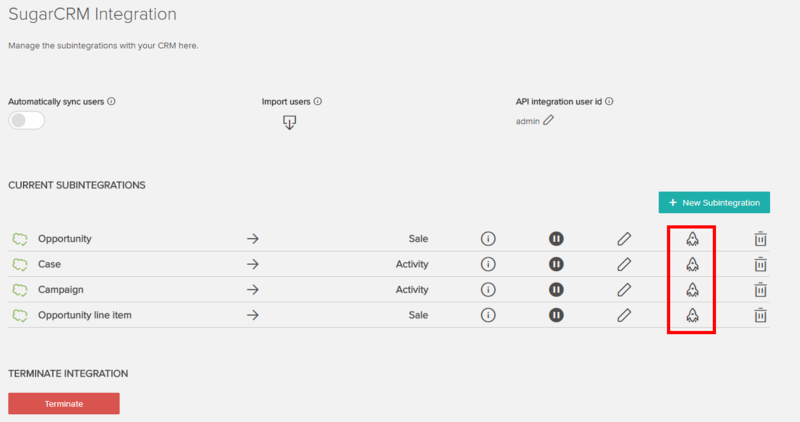 Note: It is important that you note the SugarCRM module that the subintegration is connected to. In the example above, the module is Opportunity. 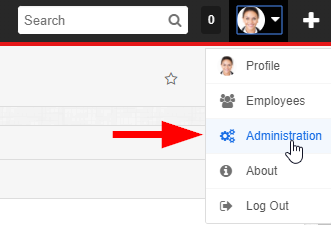 Sign in to your SugarCRM organization and navigate to the Administration dashboard. Click on Web Logic Hooks under the System section. In the list view, click the Create button to add a new webhook. You'll be prompted to input values for the new webhook. It's recommended that the Name field has the following format: "Upsert [Module name]". The module name is the same as you noted down in Step 2, which in this case is Opportunity. Paste the webhook URL value you copied in Step 2 into the URL field. Select the correct Module Name you noted down in Step 2 from the dropdown menu (plural form). In this case, "Opportunities". The Trigger Event should be set to After Save. The Request Method should be set to POST. From now on, any new or updated records, belonging to the specific module, should be pushed to SalesScreen. In this case, Opportunity records. SalesScreen will match these incoming records to the corresponding subintegration and enforce whatever configurations it has. If you want SalesScreen to remove the corresponding sales activities whenever you delete records in SugarCRM, you can enable deletion webhooks. Simply add a new webhook by repeating Step 3 and Step 4. However, set the Trigger Event value in Step 4 to be After Delete. Furthermore, the Name value of the webhooks should be set to the following format: "Delete [Module name]". From now on, any deleted records, belonging to the specific module, should result in SalesScreen being notified. In this case, Opportunity records. SalesScreen will look up potential corresponding sales activities and remove them.